First, toast the flax bread to your desired preference. Next, in a small bowl, combine yogurt, spirulina, garlic powder, cayenne (if using), and a small pinch of sea salt and stir until fully blended and you have a light blue spread. 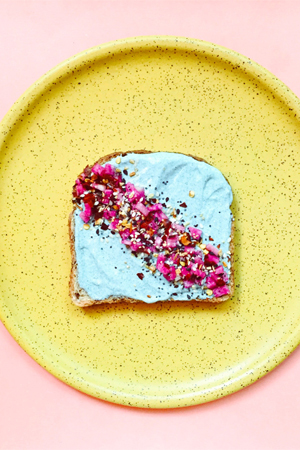 Dice watermelon radish and sprinkle across the toast, then top with a healthy sprinkling of Everything Bagel Seasoning. Enjoy!